Cruise this beautiful city on our custom made ultra comfortable Electric Bikes. get a complete and thorough look at new Orleans past and present. 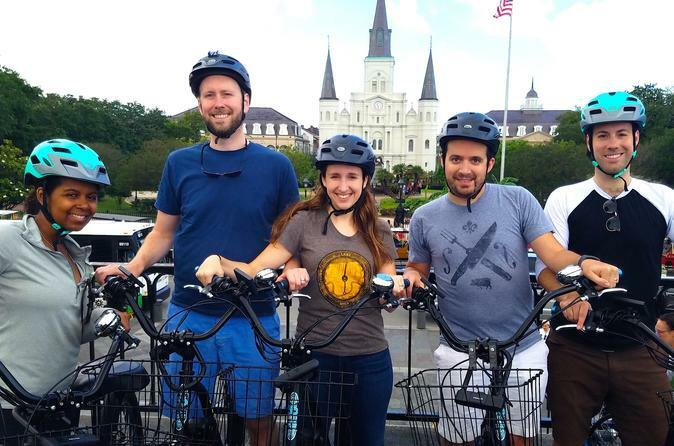 If you love history, incredible sights, architecture, tales of residents past and want a taste of the real New Orleans then this tour is a must see! We begin in the French Quarter weaving our way through the historical heart of NOLA visiting famous landmarks that tell the true tale of our city. From the Quarter we'll visit the original Creole Faubourg Marigny and see how the city grew and the reasons behind the neighborhoods' divisions and unique personalities. Then, we're on to an amazing above ground cemetery to learn the unique way New Orleans inter their deceased. See real art and experience local culture as we dash around beautiful City Park. We will continue on to historic Esplanade Ave to see the mansions of the Creole gentry. We will cruise through the incredible historic neighborhood of Treme, then a peaceful ride through Armstrong Park leading us to Congo Square. We will have one final encounter with the Quarter to cap off this can't miss experience. If you love the wind in your hair, amazing history, incredible sites, architecture, tales of residents past, and want a taste of the real New Orleans, then this is a must see!